The framework I present below is highly effective — and measurable. In fact, I have employed it at a global electronics manufacturing company, resulting in growth rates of 20 percent to 30 percent. In general, I view converting content marketing to revenue as seven pieces of a puzzle, rather than a linear series of steps. Although the overall process is best viewed in a linear fashion, it does not necessarily need to be executed linearly. If you put each piece of the puzzle together with the whole in mind, you will generate revenue with your content. For every piece of content you intend to create, you should visualize how it will churn through each of these seven steps, and out the revenue end. One caveat: Basic content marketing 101 presumes you are creating content that is relevant and useful to your target audience, so they can do their jobs better as a result of the content your organization is providing. This seven-piece framework works based on this premise. However, if, for example, you produce a bunch of product-focused promotional content that masquerades as education, the process just won’t work. As mentioned above, this process won’t work without effective content marketing, an effective content marketing process, or the proper content tools for distribution and measurement. Thus, the first fundamental task is to create effective content. It’s not all that easy, as we can see, based on the “9 percent very effective” CMI survey result. Organizations that excel at content marketing that generates revenue have worked hard to put the infrastructure of an effective process in place, including gaining executive buy-in, developing a content-centric culture in their sales and marketing departments, and putting adequate resources in place to support a documented content marketing strategy. The second fundamental component for success is to have a proper marketing plan in place before proceeding with content marketing. Every step in this process requires that you have a clear understanding of your business goals and your target audience, and this is best accomplished by developing thorough buyer personas to help you understand and address the needs of your audience through the content you create. If you need additional guidance on this, plenty of information is available on how to create effective content, as well as how to build a company culture that supports content (a great place to start is by looking on the CMI website). Alignment with sales around lead management, definitions, and who will be doing what (and when). From this point on, I’ll assume you have a good content creation machine in place, a written marketing plan, and a robust tool set in place. Now you are ready to move on to the next piece. Content will not significantly drive revenue by just sitting on your website. I suspect many of those companies that deem their content marketing efforts less than very effective are creating good content, but are only parking it on their website and hoping for improved SEO. Don’t get me wrong, good content parked on the website will improve SEO, but it is not enough by itself to measurably affect revenue. Content distribution must be integral to your marketing strategy and tactics. The content you create must be used extensively — through both outbound and inbound tactics. Your outbound ads must promote the content, just as your inbound tactics (like pay-per-click [PPC]) would. For content to be effective — and to drive revenue — you must stop promoting your products and, instead, focus those resources on promoting your content! Promoting content is a far better way to engage with your target audience than telling them about your product or service. Sorry, but it’s true: Your audience likely perceives your product or service as a commodity, but will perceive your content as value. The sooner you embrace that idea, the sooner you can start generating 20 percent and 30 percent increases in growth rates. Offer your content via all outbound channels where your target audience congregates: emails, print ads, email ads, digital ads, direct mail, social media, etc. Inbound SEM ads should also promote the content. This idea of promoting content in place of product is sometimes hard for the organization to understand, and as a content marketer, you are likely to get strong push-back on this point. So this is where the preparation of your organization comes into play. You must have strong executive support and a content marketing-friendly culture — or at least a strong understanding in place — from the outset. Otherwise, your product managers and sales people will freak out and possibly hinder your content marketing strategy. They may even force you back to a product-based strategy — and back to those dismal growth numbers of 1 to 5 percent. It is imperative that all outbound and inbound activities drive to a custom landing page. Do not send them to a regular web page, and even more importantly, do not send them to your home page! Once they take the action step (click on or type your URL), they should be directed to a custom designed landing page optimized around the offer of the content. If you send them to one of your regular web pages, you lose, especially if you send them to a product page. The more relevant you can make the landing page, the better chance you will have at earning their engagement. The offer of your content asset: This should be perceived as the main function of the landing page. A description of your business, and your value proposition: You want to offer content they find valuable, as you want the visitor to connect the goodwill generated by the asset to your brand’s overall offering (awareness + credibility). Present the offering as a side panel, not as the main focal point of the landing page. Easy access to more information on your company: The goal here is for visitors to think to themselves, “Who is giving me this valuable information? I want to know more.” Always give a visitor the option to “raise their hands” and make a direct connection. Remember, your outbound ads and PPC ads should both drive to the landing page. Do not fill the landing page with product-based information. The last thing you want is for your visitors to feel like they fell victim to a bait and switch tactic, tricking them by directing them to a product page when they were expecting valuable information. Although the call to action (CTA) is integrated into Piece No. 3, it is important enough to merit its own section here. This is where the quality of your content matters. If you have created something that is of interest to your target audience, they will be more willing to take an action to learn more. You have to tell them what you want them to do! In the digital realm, it usually involves a click. Again, you have to directly ask them to “Click here to get the paper” or “Register here,” for example. Don’t leave it up to readers to figure out what they’re supposed to do once they see your content. If it isn’t really easy, you might lose them. If you don’t make clear what you are offering and how to get it, you’ll lose a great deal of potential effectiveness. At this point, a person from your target audience has clicked or responded to the CTA in your ad, arrived at your custom landing page, has been delighted to easily obtain a useful and helpful piece of content, has put your brand top of their mind, associated value with your brand, and associated your company with a particular benefit. Additionally, they may have explored your website, shared the content via their social media channels, forwarded the email, or even requested a contact action from your sales team. At this point, it is important to decide what happens next. Is the visitor a marketing qualified lead (MQL) that should be sent over to the sales team for direct action? Should they be sent to a nurturing program? Would it be best to hold off on contacting them until they see your next great piece of content? Each of these choices are valid actions, and will depend on your particular business practices. Or, send them into a nurturing program. This is where your marketing automation platform becomes a critical component of the content to conversion process. Throughout the nurturing process, your contacts will be receiving more great useful information (content) and getting to know your company — and your associated offering — through regular website visits. As they visit and interact with your content, you should be measuring that activity — ideally with some type of lead-scoring program. Success of the qualification step depends on close alignment with your sales team. You should have an agreement in place specifying the point at which any of these contacts should be considered ready for a call. Your decision may also be to just let the contacts decide for themselves when to proactively reach out to your sales team — and this is fine, as well. 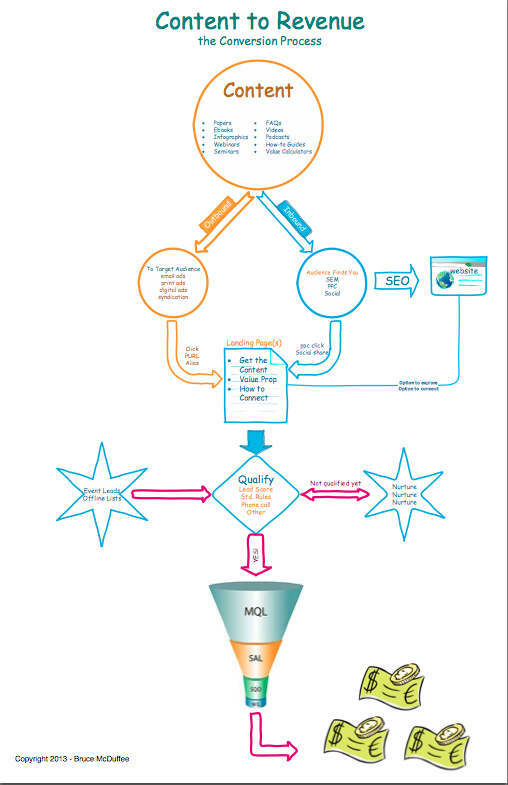 If your content is educational and you’ve complied with all the best practices of offers, PPC, landing pages, etc., you’ll be flooding the top of the funnel (and the sales team) with qualified leads, as well as filling the nurturing funnel with tons of future buyers. 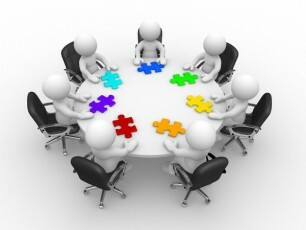 I would like to re-emphasize the importance of collaborating with sales on each campaign. They need to understand what’s happening — and why it’s happening — as the leads start flowing into their inboxes. Those contacts that do not qualify should be sent to a content-based nurturing program. While in the nurturing program (where you offer them even more great content you’ve created) they are engaging more deeply with your company and its value proposition. As they engage, you are increasing awareness and credibility in their minds. When the day comes around and they finally are ready to buy what you offer, your firm gets the call because of this awareness and the credibility you have achieved. The final step is, of course, the purchase (and, hopefully, many future purchases). After the contact is passed along to the sales funnel, content can be used to move them along in their decision process toward a positive outcome for your firm. Sales people should be trained how to use your “later funnel stage” content to help close more deals. Late stage content is where you talk about your products, case studies, application notes, etc. Keep these seven pieces of the puzzle in mind for each and every piece of content you create. You should never create content without having a plan for conversion clearly specified in advance. Effective content marketing is heavily interwoven with the marketing strategy and tactics, as well as with your organization’s sales process. Cultivating your target audience members so they become life-long customers is all about engagement. You want them to place your brand and associated offering top of mind and with a great deal of credibility. If you are able to achieve this position in their minds, when they are ready to purchase, your firm will get the call. Competitors who are not using this type of framework may get a call, but they will have minimal credibility and only be used for a price comparison. This seven-piece framework will help ensure that your business will be the winner of market share — and accelerated revenue growth rates. Need help finding which content marketing tactics will put your business on the path to greater success? Check out our guide toBuilding the Perfect Content Marketing Mix: Execution Tactics.